The grain elevators in Elva, MB, Aug 2014. Contributed by Steve Boyko. 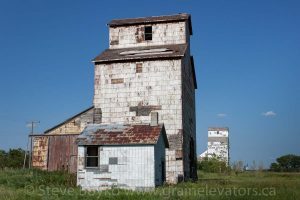 There were lots of updates and new grain elevators on this site from mid March to now. I’ve been moving pages from the Manitoba Grain Elevators site to here in preparation for retiring the MGE site. I think I will have to renew the domain name for one more year, but most of the pages on that site redirect to here now. Thanks for reading, and special thanks to our contributors for submitting photos!